Induction motors are frequently used in both industrial and domestic applications. Within the induction motor, an electrical current in the rotor is induced by a varying magnetic field in the stator winding. The rotor current produces it's own magnetic field, which then interacts with the stator field to produce torque and rotation. One way to analyse and understand the operation of an induction motor is by the use of an equivalent circuit. Before jumping into the equivalent circuit, a few concepts are useful. The rotational speed of the stator flux and rotor flux are identical. This is the same as in a transformer and allows us to model the behaviour of an induction as a transformer with an air gap. From the preceding, we can utilise the equivalent circuit of a transformer to model an induction motor. In the equivalent circuit R1 represents, the resistance of the stator winding and X1 the stator leakage reactance (flux that does not link with the air gap and rotor). Magnetising reactance required to cross the air gap is represented by Xm and core losses (hysteresis and eddy current) by Rc. An ideal transformer of N1 and N2 turns respectively represents the air gap. For the rotor side, the induced emf is affected by the slip (as the rotor gains speed, slip reduces and less emf is induced). The rotor resistance and reactance are represented by R2 and X2; with X2 being dependant on the frequency of the inductor rotor emfs. The equivalent circuit shown above has removed the dependence on slip for determining the secondary voltage and frequency. Consequently the circuit can be simplified by eliminating the ideal transformer and referring the rotor's resistance and reactance to the primary (denoted by ′). The referred values are calculated by multiplying them by k2, where k is the effective stator/rotor turns ratio. Note: it is relatively straightforward to obtain the equivalent circuit parameters by testing. Typically this would involve a d.c. test, no-load test and locked rotor test. The simplified equivalent circuit allows us to calculate the operating parameters for an induction motor. Note: calculations are vector quantities. Should complex representation be used, then phase shift, power factors, etc. automatically fall out of the calculations. From this equation, it can be seen that as the rotor speeds up (slip reduces), the circuit impedance increases and stator current decreases. Note: if you need more help on how to reduce the equivalent circuit to a single impedance, you can have a look at our Network Theory – Introduction and Review note. Windage and power losses are necessary to give the full picture of how the input power is to a motor is translated to shaft output power. 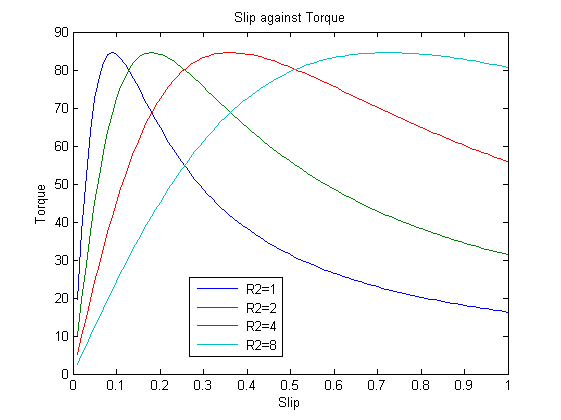 To see how the equivalent circuit can be used, we can look at an example of investigating torque-slip characteristics. Example - consider a three phase motor 400 V motor with 4 pole pairs and the following equivalent circuit parameters R1=1 Ω, X1=3 Ω, R′2=1 Ω and X′2=2 Ω. 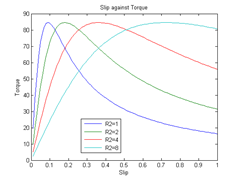 Plot the torque slip characteristic. Also consider the effect of varying the referred rotor resistance, R′2 (1, 2, 4 and 8Ω).